The transmission is so delayed, unpredictable and jerky that you might as well be driving a rocking chair. The engine has little to no refinement and, being located inside the cabin with you, will make your ears bleed. Then you have the little things (excuse the pun) such as its unintuitive way of opening the rear hatch or its irritating beeping noise, which I’m convinced is a tactic used in Guantanamo, whenever you start it up. On top of it all, it’s fairly overpriced for what you get. 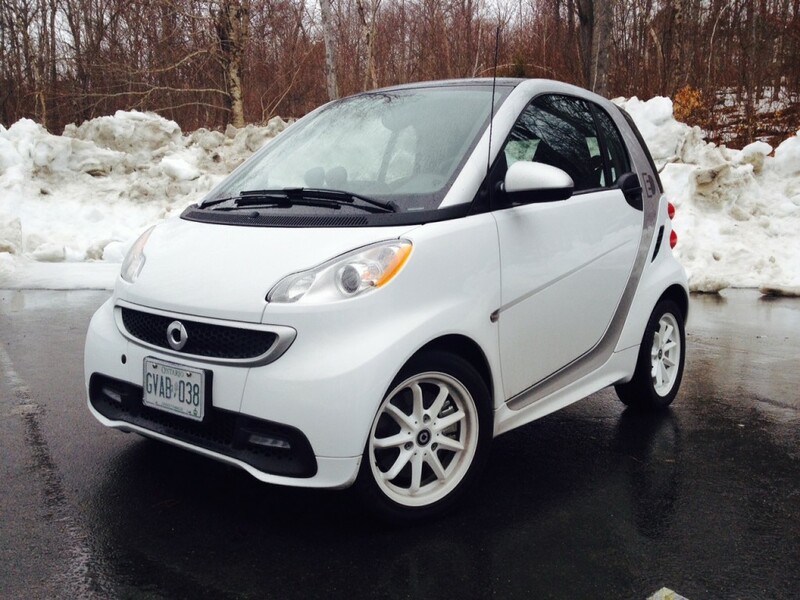 You can option out a Fortwo to over 20 grand. That’s entering Prius territory which has more seats, more refinement, more practicality and, crucially, gets better gas mileage. As the smart enters into its third generation, Mercedes-Benz (who owns the smart brand) has electrified the otherwise cute little car. Does it have what it takes to make the smart a credible contender again? 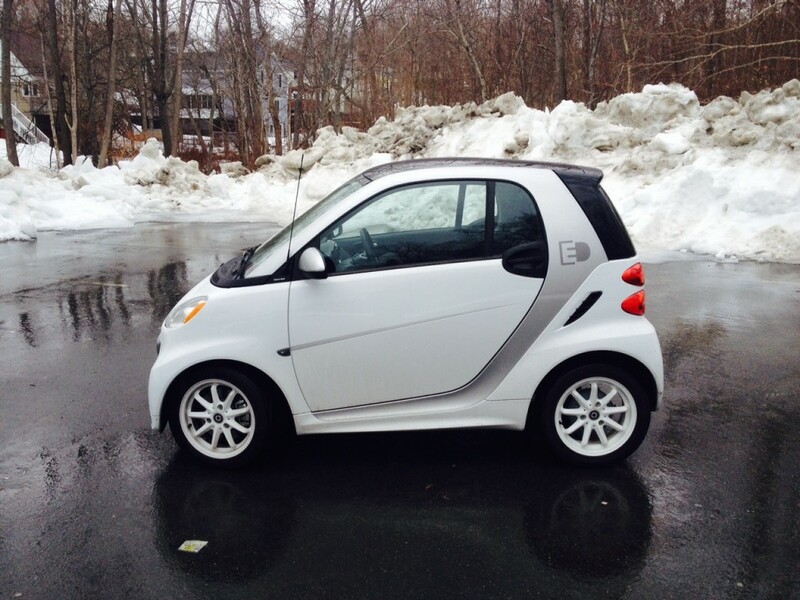 The exterior looks of the smart is definitely polarizing but this author finds the design quirky enough to be likable. For 2015, smart has introduced the most minor of exterior updates which includes adding LED daytime running lights and moving the smart badge from the hood to the grille. 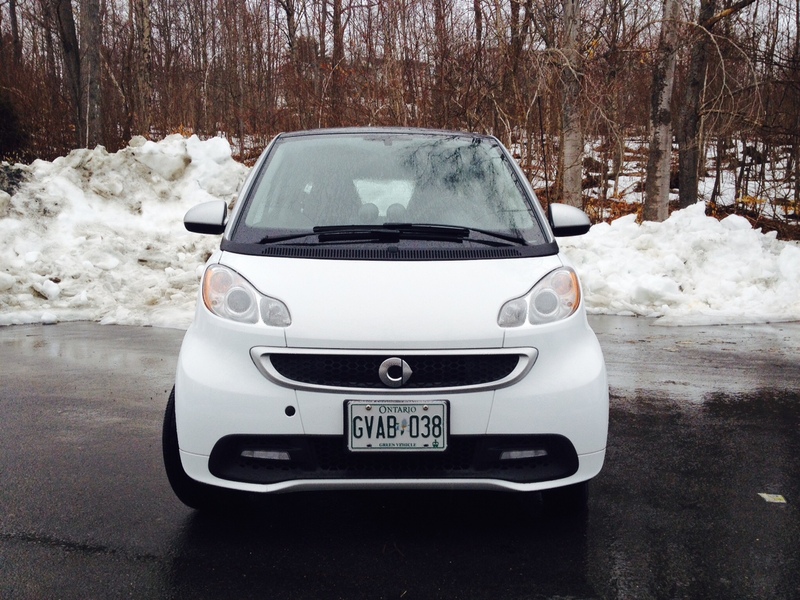 Surprisingly, it’s actually enough to keep the ForTwo fresh until the third generation hits our shores. The smart doesn’t reveal its lack of an internal combustion engine visually either. There’s a rather clever looking graphic on the tridion cell which mimics a plug and outlet but can also be seen as the letters ‘E’ and ‘D’. Hopefully I don’t need to tell you what that stands for. In case you still can’t figure it out, there’s badging which says ‘electric drive’ on the back. And that’s about it. My tester came with the optional white wheels you see in the photos. If you’ve ever been inside a smart car before then the cockpit will remain familiar to you. It’s fairly bare bones, and there are a few quirks like the ignition switch located between the two seats and the controls for the climate being located next to the vents, but overall it doesn’t take long to get used to the controls. While quality isn’t exactly along the same line as a Mercedes, it’s still quite decent. And yes, there are two cup holders which are large enough (and out of the way enough) to cary your big gulps. The car itself is actually large enough to fit most statures. Sure, its narrow body means you sit uncomfortably close to your passenger, but even people who have grown past the six foot three point should still be able to fit and fit comfortably. Unfortunately, the electrified smart still has the same problems as its gas engined brother in terms of hatch operation. It is a split tail gate meaning you have to open the glass portion first before the bottom portion. And there isn’t a way of opening the glass portion without a key. Once it’s open, you then need to use both hands to unlock and lower the bottom portion. Just imagine trying to do all that with your hands full of groceries. The good news is, once you do eventually fumble to open, you’re greeted it a relatively decent amount of space to carry smaller items. All this is to say that while there could be improvements to functionality, you definitely shouldn’t count the ForTwo out in terms of intelligent use of space and design. 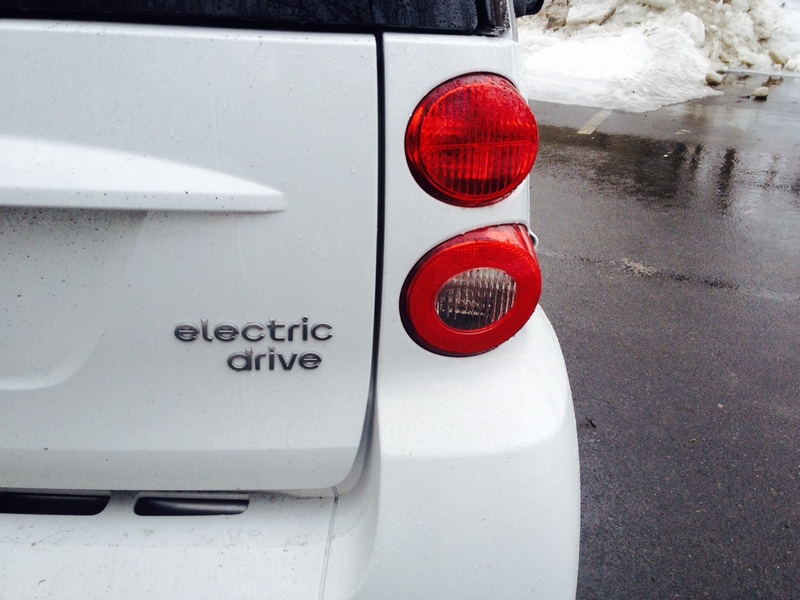 Now let’s get to the reason you’re likely reading in the first place: the electric drive. It is a 55 kW electric magnetic engine which produces 74 horsepower with 96 pound foot of torque mated to a one-speed automatic. If those numbers seem overwhelming, keep in mind that it weighs only 900 kg. Besides, peak torque comes in almost instantly, allowing you to embarrass all those youngin’s in their souped up Civics at the lights who were childishly pointing and laughing. I’ve honestly never experienced such instantaneous torque before and it quickly becomes quite addictive but be forewarned, just like gas engined cars if you keep your right foot down you pay for it at the pumps. 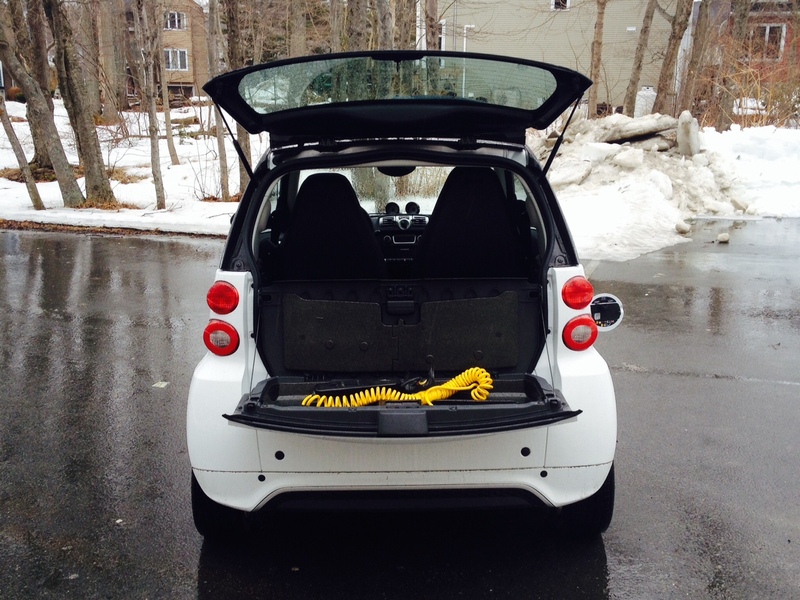 The ForTwo will guzzle all its electricity as well if you continuously drive it like you’re at a drag strip. As mentioned, power comes in early and stays with you until you ease off the gas, where regenerative breaking takes over in an attempt to regain at least some of what you lost. 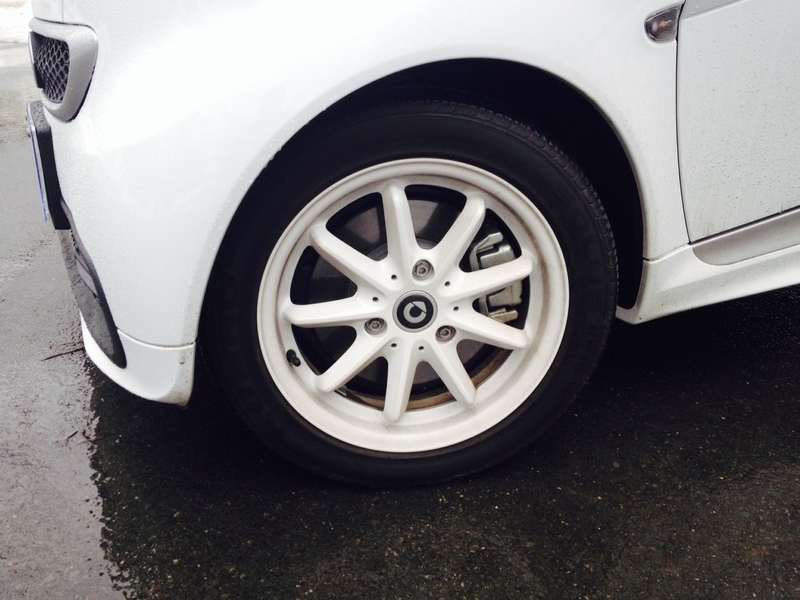 The sensation is similar to engine braking and it actually works quite well. But the real story is the fact that there is only one gear. That means no rocking chair sensations while driving, just a smooth linear power band. Oddly enough, my tester came equipped with paddle shifters which are made redundant due to the sole fact that there isn’t another gear for you to manually select in the first place. Luckily this is a $250 option (that also gets you a three spoke steering wheel and leather shift knob), so save yourself the money. With the electric drive’s newfound capability to engine some life into the ForTwo, you also get the sensation that you are driving a go-cart whenever you take a corner. It feels quite tossable and surprisingly stable. On top of it, you actually get decent feedback from the steering as it has a direct and firm feeling that even some performance cars would kill to have. 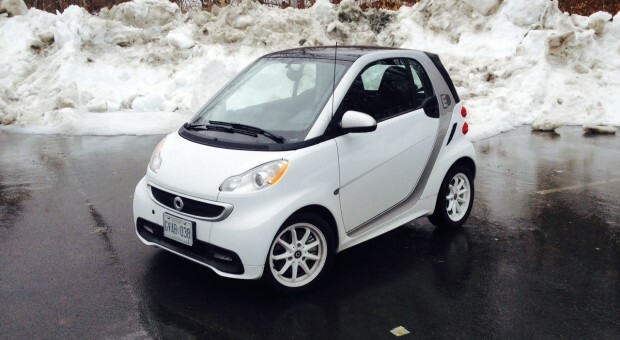 The short wheelbase does make for a bit of a choppy ride, however the ForTwo’s size and nimbleness makes it quite easy to dodge the smart-car-sized potholes around Halifax. Speaking of Halifax, I looked up where the charge stations were in the city and sadly very few came up in the search, however it should be noted that there is a new charging station at the Halifax market as well as a new charging station situated at or near the Barrington Street Superstore. Otherwise, Nova Scotia Power has a few and the IWK Children’s Hospital appears to have one as well. 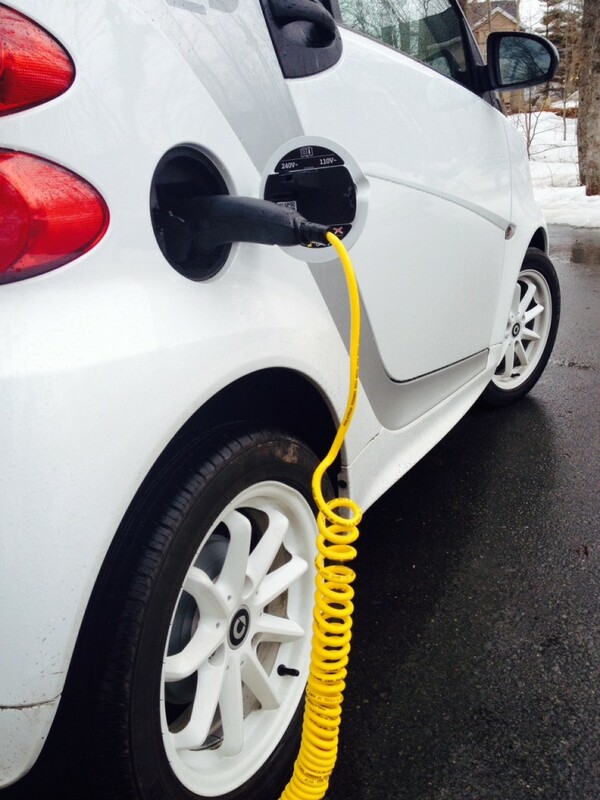 That means most people will likely be charging their electric vehicles at home. This can be done with a regular outlet and charge time takes approximately 14 hours from a household outlet. You can purchase a more powerful charging outlet to be installed at your home for thousands more, but I found just a bit of proactive planning was all I needed. And no, not at any point did I suffer from range anxiety, partly because it has a decent range of 109 kilometers and also because 99% of my driving was city driving. I did take it out on the highway and it does just fine. In fact, it does more than just fine as a car in general. This is what the original smart ForTwo should have been in the first place: a fun to drive, refined way to get from point A to point B in the city without having to worry about gas prices. In that guise it makes almost too much sense. Unfortunately, there is a bit of a price to pay up front. The electric drive starts at just over 26 grand. However, if you compare that to other electric vehicles on the market, it’s about five to ten grand cheaper. 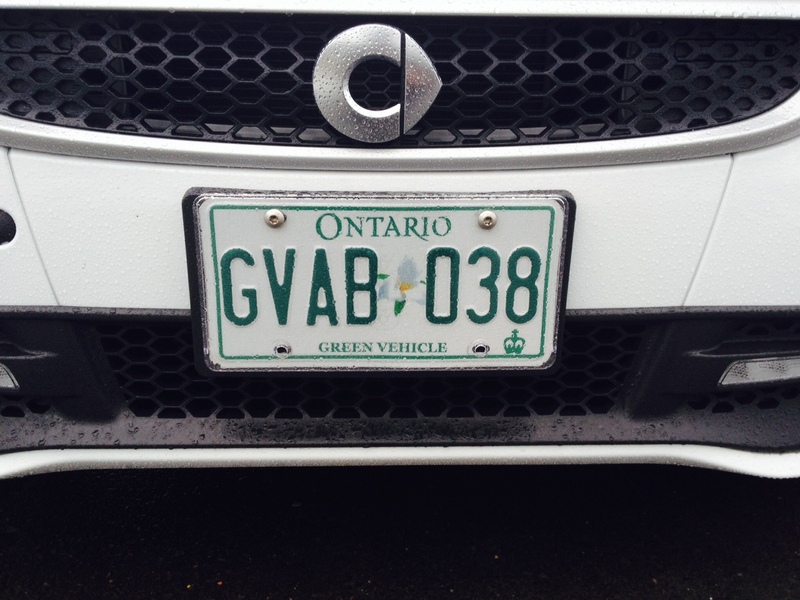 And if you live in Ontario, Quebec or BC there are sizable government rebates to be had on it. And if you’re in those provinces and are buying the electric drive to environmental reasons then it makes even more sense. Because unfortunately here in Nova Scotia, we still use coal to power electricity which may negate any savings to the environment every time you charge. 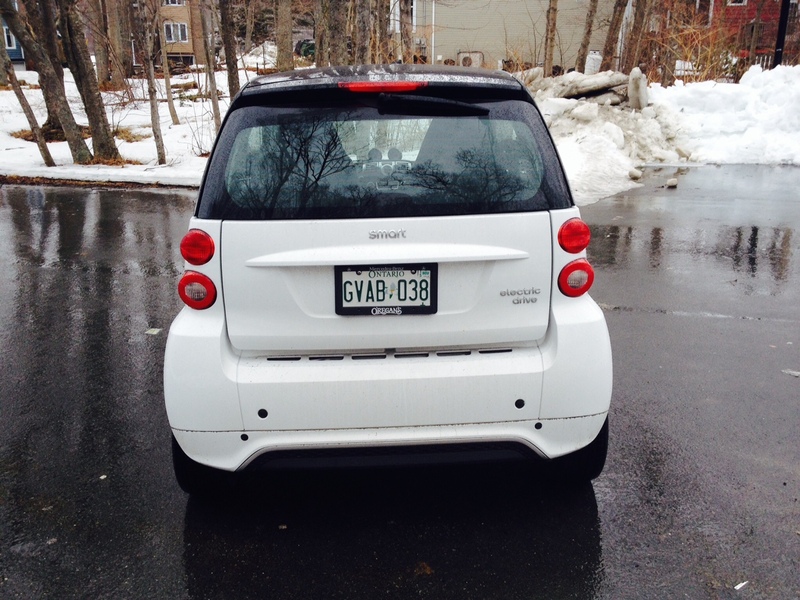 But in the end, I walked away completely happy with the smart ForTwo electric drive. As mentioned, this is what the smart should have been from the get go and I’m happy to say that it has now earned a spot on my coveted most favourite list. Why do I have paddle shifters? All-Electric Mustang In The Works?